November 26, 2010, 6:40 p.m. It was a throwaway line in a Facebook thread about the Giants and their girlie-man beards. October 27. A my-beard-is-better-than-your-beard-I'm-manly-and-you're-not kind of thing. San Francisco had just taken Game One of the World Series, and I was attempting, however lamely, to buoy the spirits of my Dodger fan friends, along with my own. 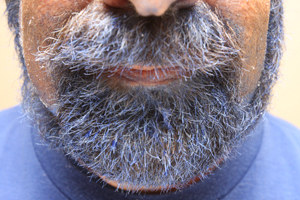 With suggestions about the shoe polish enhancing of Friscan beards abounding, and clearly pissed by even so much as their NLDS victory, I said "if the Giants win the World Series, I'll dye my beard blue." Five days later, shaken to the core by the darkest sports occurrence in generations and hurting something awful, I was taken to task for my beard proclamation, on Facebook, by my alleged friend, Kevin Conley. There was no backing down. What self-respecting Dodger fan would have been OK with that? 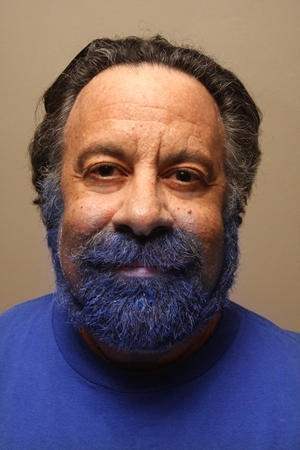 Nope, I was going forward as a blue beard, and with photographic proof below, am proud of it. The only reason it took me until Thanksgiving is because I'd just trimmed the beard to within millimeters of its existence when Kevin demanded action, and if I was going to show my manliness, and by extension my superiority, I needed a few weeks for the thing to grow out. So there you have it. 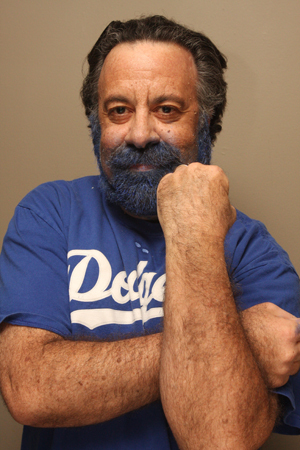 My Dodger blue beard – for your enjoyment, horror, ridicule or praise. And perhaps inspiration. The Giants winning the World Series is incredibly motivating,or at least, it ought to be. I'm ready for Opening Day right now. Clayton Kershaw vs. Tim Lincecum, at the Ravine, April 1, 2011, 1:10 p.m.
Oh, in case the second photo below needs explanation (and it shouldn't), recall the Casey Blake-Brian Wilson home run celebration flap of May 9, 2009. Unlike Blake, no apology will be forthcoming, and I'm taking it a step further. While We Were Away: Say what you will about the money spent, the Dodgers have put together a fine starting rotation. You're going to have Chad Billingsley facing Matt Cain April 2, and probably Ted Lilly going up against Jonathan Sanchez in Game Three of the 2011 campaign at home. Last week's key signing of Hiroki Kuroda, and the surprise return of Jon Garland today assure L.A. one of the best starting staffs in the National League. The latter is an especially helpful deal, because while Lilly and Kuroda are at least somewhat at risk of injury, Garland simply never misses a turn. Very important. Stealing Garland away from the Padres is an added bonus. Now watch as they grab the other half of the San Diego battery, by bringing in Yorvit Torrealba on a short-term contract. No, I have not given up on Russell Martin. Not at all. But the Dodgers have long avoided employing a catching tandem, and I think 2011 is going to be the year they finally go the route of some of their competitors. With someone like Torrealba around, Martin can do a little super-sub work, filling in at third base, second, maybe even a bit in the outfield, catch, all while remaining fresh over the long haul. You might think it's an odd idea, but remember you heard it here first. Left field is next on the agenda, and while I have a feeling a surprise is in the works there too, I also think the Dodgers are going to wait out the markets (both free agent and trade) rather than jump in quickly. I'm not going to pretend I have an inkling about the Dodgers bullpen plans, but I'm fine with the usual turn-over that occurs, not just in Los Angeles, but throughtout baseball. They'll get it worked out. Now look, we all had some fun at Don Mattingly's expense back in September, but that really does seem like a long time ago, and it's time to let it go. I don't know how to split the credit between Mattingly and Ned Colletti, but they've done an excellent job remaking the coaching staff. I like Tim Wallach and Dave Hansen, Trey Hillman is a thoroughly qualified bench coach, and the club handled the entire matter smartly and professionally. And of course, I'm ecstatic about Davey Lopes returning to Los Angeles. He was one of my favorite players growing up, and I was always jealous watching him coach the Padres and Phils from the first base coach's box over the years. It's great to have him back in Dodger blue. Just great. Everything that's been said about Lopes' handling the running game, working with Matt Kemp, and instilling some Dodger pride is right on. It's a custom fit, and I couldn't be happier if they brought in Orel Hershiser to replace Rick HoneyGoltz. But OK.
Why We Were Away: I'm delighted to have the following as my excuse for not posting for the better part of November: I picked up a book project. A baseball book project, and I'm about as excited as can be. Totally stoked.